You deserve a workstation with a keyboard setup that's as individual as you are. 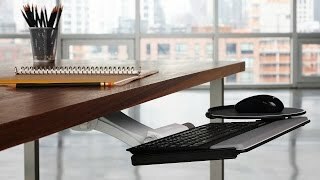 The Humanscale 800 Radiused Keyboard Tray can help bring your curved workspace or cockpit-style desk to the next level, ergonomically speaking. The tray is designed to fit within the curved edge of a radiused corner, letting users mount a keyboard tray where they couldn't before. Get closer to your work and type in a more supportive position; negative tilt keying can help to keep wrist strain at bay, letting you task in much more comfort than you ever thought was possible. The Humanscale 800 keyboard platform design fits most keyboards and desks with 11 inches or more of depth. Select the mechanism, mouse platform, palm rest, and other customizable features to build your ideal workstation of dreams. The Humanscale 800 Radiused Keyboard Tray is only available in Black. Select from two different 19" palm rest options for your Humanscale 800 Radiused Keyboard Tray: foam or gel. Both are covered with an easy to clean, black synthetic leather. A 19 inch slim gel palm rest with synthetic leather cover is also available for users with thin keyboards. The slim palm rest is only about a quarter of an inch thick and is available in black or silver. Slim palm rests are not compatible with swivel mouse platforms. When designing your Humanscale 800 Radiused Keyboard Tray, if you choose to not add a palm support, there will be holes located at the installation points on the tray. The Humanscale 800 Radiused Keyboard Tray can be ordered with a black mouse pad to fit any of the available mousing platforms.